Zach Martin is a diligent litigator and researcher with a knack for solving complex problems. Zach is a natural problem-solver with an affinity for research and writing. He has worked on a wide range of matters, including complex civil litigation, white collar criminal defense and state government investigations. As an intern at the U.S. Attorney’s Office for the Middle District of Alabama during law school, Zach researched and prepared briefs on a variety of legal issues involving criminal and civil cases. He has a particular interest in product liability litigation and commercial litigation. Zach is involved in the Defense Research Institute’s Young Lawyers Committee and is a member of the American Bar Association. He graduated from the University of Pennsylvania Law School, where he was an associate editor of its Journal of International Law. 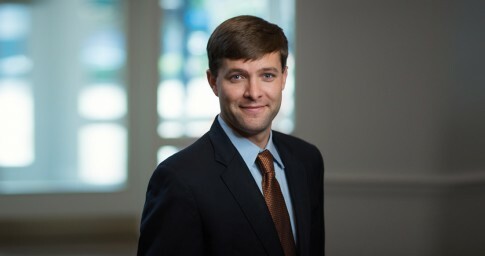 He was also involved with the school’s Public Interest Law Center, Civil Rights Law Project and was the president of its Southern Law Students Society. Outside of the office, Zach enjoys hiking, running, playing basketball and watching Auburn University football. Prior to moving back to his hometown of Birmingham, Zach lived in New York, Philadelphia and Budapest, Hungary. He now lives with his wife, Lauren, and their Giant Schnauzer, Obi. Securing total dismissal with prejudice for a manufacturer in an asbestos case alleging that exposure to products caused mesothelioma. Representing an aggregates business in a commercial arbitration against a lender. Representing an excess coverage carrier in a medical malpractice case with no liability assessed to the client.